Tsitsipas made Federer feel the heat. THERE is a new world order coming in men's tennis with 20-year-old Stefanos Tsitsipas ending the run of defending champion Roger Federer in the fourth round. The NextGen Finals champion beat Federer, who is 17 years his senior, 6-7 7-6 7-5 7-6 on Rod Laver Arena to become the first Greek player in history to reach the quarter finals of a Slam where he will meet Spain's 22nd seed Roberto Bautista Agut. 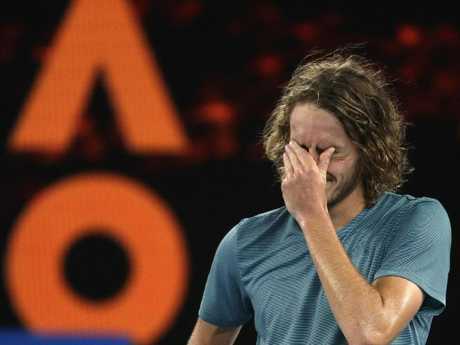 John McEnroe said he looked like he thought he would win in the post-match interview, with Tsitsipas' answer making the crowd laugh. "I truly agree with you," he said. "Actually, from the very beginning, you need to have that mindset in your capabilities in what you have in your abilities as a player. Stefanos Tsitsipas's Australian Open run continues. "Roger is a legend of our sport, I have so much respect for him. He's played such good tennis over the years, I've been idolising him since the age of six, it's a dream come true just being on Rod Laver facing him. Winning, I cannot describe it to you now. "Playing here at Rod Laver Arena was something I dreamt about as a kid. The atmosphere, the vibe, the energy that you guys gave to me and to Roger today was indescribable." "I lost to a better player who was playing very well tonight," he said. "Hung in there, gave himself chances at some point, stayed calm. It's not always easy, especially for younger guys. Credit to him for taking care of that." 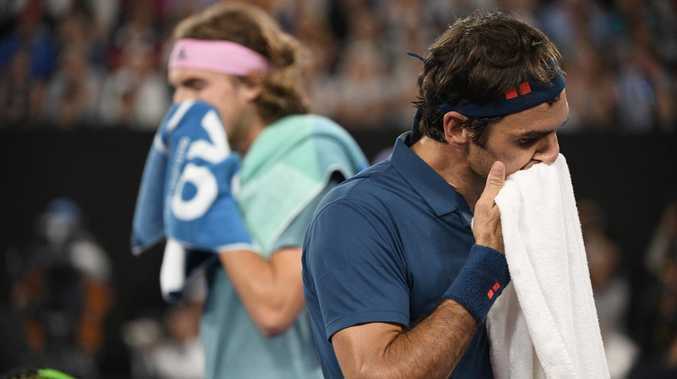 Federer couldn't take advantage of his opponent's plight and Tsitsipas sealed the win on his first match point in the third tie-break of the match.